Watch the sunsets from the privacy of your own bedroom balconies as you immerse yourselves in Guanacaste culture. This exquisite 3000 plus square foot Costa Rican-style 4 bedroom, 4.5 bath home was designed and built by local artisans and furnished with hand crafted pottery and furniture native to the Guanacaste Region. Coming to the oceanfront Casa del Sol where the deep blue sand sparkles will make you want to return to Costa Rica again and again. Our guests will enjoy this Costa Rica experience in complete comfort and security. You can walk out your own front door at Casa del Sol and feel the beautiful cobalt blue sand and the majestic Pacific Ocean. You will hear and see the famous Howler monkeys a few steps out the back door. You can walk a few short steps to the two restaurants in the aptly named safe and secure boutique resort, Azul Ocean Club Resort. Or if you prefer, a private chef can be arranged for your enjoyment. The magnificent Casa del Sol can sleep 10 comfortably. It comes fully equipped with a complete kitchen, laundry, housekeeping, and multiple balconies with comfortable outdoor chairs to watch the sunsets. Individual bathrooms are provided for each bedroom. Two outdoor showers are available for your comfort. So whether you are on your private bedroom balcony or sitting at the outdoor dining table with many friends, you will see Costa Rica like never before at the spacious Casa del Sol. Pura Vida! Don and Phyllis Ayers made their dream of owning ocean front property in Costa Rica a reality in 2006. They reside in Virginia where they like to get away from the harsh winters and visit their house at Playa Azul. Their daughter Candace who lives in California manages the rentals. She too loves Costa Rica and visits as often as she can. Casa del Sol is the perfect spot for those travelers who like pristine places off the beaten path. The house has beautiful views of the ocean. In addition the beach and the ocean are just a few steps out the front door. For those travelers who want to see the authentic Costa Rica, Casa del Sol at Playa Azul is the perfect spot. The woods in the back are home to the howler monkeys. The beach and the ocean are in the front. outdoor shower, Two showers are available outside. The beach at Playa Azul is just a few steps out the front door. Casa del Sol has great views of the ocean from all the balconies and rooms. We are just a few steps from the beach. Air conditioners in each of the four bedrooms plus one in the kitchen and one in the common area. Extra linens are in the laundry room. Instructions for usage are in English. Towels and beach towels are provided. Extra towels are in the laundry room. Available at Azul Ocean Club for a nominal consumption fee. Plenty of dishes and utensils for 10. Dining room seats 8 easily and outdoor dining area for an additional 8. Beautifully manicured gardens surround Casa del Sol. Large balcony upstairs and every bedroom has a private balcony. Fishing, diving, snorkeling, nature tours available with Paski Adventures on-site. Beautiful infinity pool with swim up bar available at Azul Ocean Club for a nominal consumption fee. Casa del Sol is secure and protected by ADT alarm system. Catering Available: Private Chef Available Food Shopping available. Two Restaurants on Site. Other Activities: Canopy Tours, Arenal Volcano Tour, Ostional Wildlife Refuge, Ridley Turtle Watching, Eco Touring, Surfing Schools, Many other tours available. A beautiful vacation home! Well equipped with all the comforts of home. Nothing like falling asleep to the sounds of the ocean waves. This property is very secluded, you will have the beach all to yourself. Surf is strong so not ideal for young children. There are two other beaches very close to the house in neighboring towns that are great for swimming, surfing and snorkeling. This was the perfect spot for our family holiday gathering. Quite, relaxing, and close to amenities. The house is great. Enough kitchen stuff... blender, coffee maker, pots pans, and a small market close by if you need to cook. We didn’t do much of that. Far enough away from the really busy places, but still close enough to enjoy plenty of the country. Even if you don’t venture out, the resort has all you need for dining and stuff to do. Nice gym, nice pool, quiet beach, and a really good restaurant. Excursions can be booked close by also. Dave thanks so much for your great review. We loved having you and your family as guests at Casa del Sol. We are very happy that you love Costa Rica as much as we do. We hope that the next time your travel plans include Costa Rica you will think of us. We really enjoyed our stay at Casa del sol. Very comfortable and fully equipped. The location is excellent for rest and relax. The maid service can not be better. Casa del sol: the best of Guanacaste coast. A Beautiful spacious home. The waves of the Ocean can be heard in the house, and the location with Azul Ocean Club across the street is ideal. Azul Ocean Club made the freshest food and cocktails (ask for a watermelon mojito) The Costa Rican People are so nice and welcoming. We did an activity a day. Day 1 was Quadding all over Playa Azul from the mountains to the beaches, Day 2 was horse back riding along the beaches, Day 3 was a Fishing trip catching many different types of fish, Day 4 going to see Sunset at La Luna, Day 5 was shopping in Tamarindo, Day 6 was chillin at Azul Ocean Club pool. Day 7 sadly leaving Paradise! Lisa so glad you and your family enjoyed Casa del Sol and all the area has to offer. We look forward to having you back! We have stayed at the Casa Del Sol several times over the past couple of years. It has all the conveniences of home, but just look out the windows or sit on the verandas to see you are really in Beautiful Costa Rica. Close to the ocean with the Azul Ocean Club right next door. You can walk to their restaurant for a wonderful meal, or cook at home as the house is fully furnished with all you would need. The home is spotless and well furnished - loved the Costa Rican rocking chairs! Comfortable beds. Lots to see nearby, Playa Juanillo, Octional with the turtle preserve. Tiki Hut with "the best" surf break in the area. Playa Negra and Avellanas are not that far away. 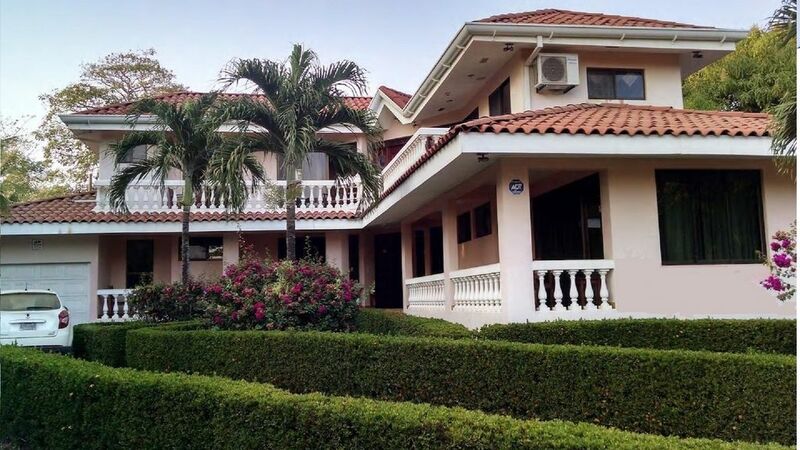 Casa Del Sol is a great place to have a wonderful Costa Rican experience. Excellent vacation spot - highly recommended! Six of us stayed here and it couldn't have been better. The house is very accessible to the beach (30 second walk to the sand) and is across the street from restaurants and the pool. All of us had a bathroom next to our bedroom and air conditioning in each room. The owner arranged a fishing trip for us, which was a lot of fun - we caught red snapper and had plenty for several meals. Casa del Sol is located across from Azul Ocean Club Resort on Playa Azul Beach in the Guanacaste Region of Costa Rica just 90 minutes from the Liberia International Airport between Tamarindo and Nosara. For a small consumption fee guests of Casa del Sol have use of all the amenities of the resort. Until confirmed, rates are subject to change without notice. Excessive electricity fees and excessive cleaning required will be billed to renter.